There are two main forms of patchwork that I have come across. 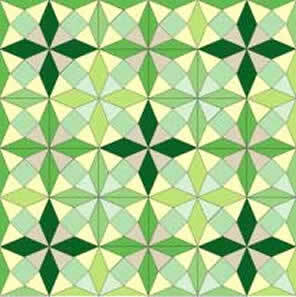 "English" patchwork is mainly based on tessellations, largely of squares and hexagons. 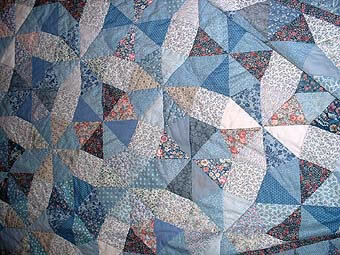 "American" patchwork or "piecing" is usually based on patterns in squares that are built up into the finished quilt. There are many different kinds of designs. 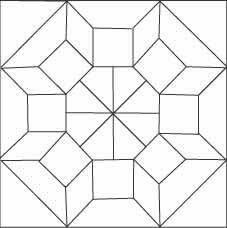 I find those based on an octagon in a square the most satisfying. This pattern is called "Castle Wall". One square (made larger than usual) is a cushion cover. Now I have started to make another quilt. 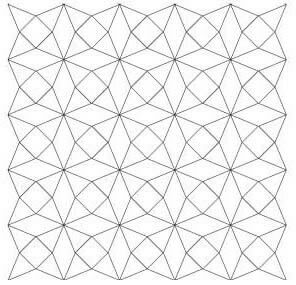 It is a pattern known as "World without end" and it too is based on an octagon in a square. 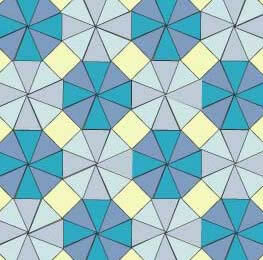 The Kaleidoscope pattern is turned about so that the square is the centre of the pattern piece instead of the octagon. Two of the isosceles triangles are joined and then sliced the other way to make half of a rhombus. Again the design looks different when it is coloured. The changes are even more noticeable when the quilt is "pieced" from fabric.These are the first four squares out of thirty-six! I did not use a computer for making the pattern pieces for many years. They were constructed in the time-honoured way with a pair of compasses, ruler and graph paper. It can obviously still be done like this. My favourite book (see references below) on the subject actually shows how most designs can be made by paper folding. I never found this very reliable, but it is interesting mathematically. The most useful aspect of using modern technology is the ability to scale by any percent. This means that the design can be drawn out any convenient size and then scaled to what is needed. 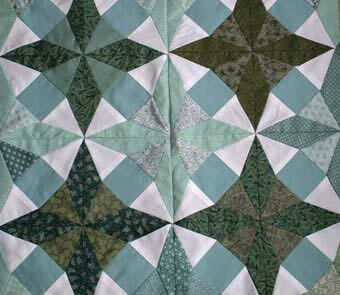 My advice to those who would design quilts is this: Go ahead and make the patterns, it's great fun, but only set out on cutting and sewing fabric if you are prepared for a long, hard slog! The best book on the subject is, amazingly, still in print after 24 years: Jinny Beyer Patchwork Patterns published by Bell & Hyman 1982.